Mix Soap Flakes and Hot water in a bowl together. Mix real good. This mixture will be hard to stir. 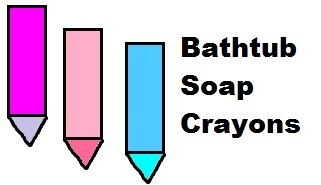 For multiple colors of bathtub crayons just scoop small amounts into a few other bowls and add your different colors to each bowl. Mix until you get a thick paste. Take this paste and scoop into a mold or some ice cube trays. Set them somewhere to harden. Let them set up for about one week then take them out of the ice cube trays. You might need to let it dry a few more days once it's out of the ice cube trays. Then let the kids have fun drawing all over the shower walls. YEAH!